Is your partner a die-hard chocolate lover who can survive on them any day any time? 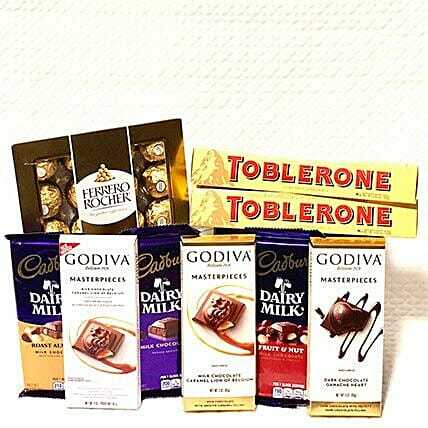 If yes, then this luscious hamper containing exotic chocolates from the house of Ferrero Rocher, Toblerone, and Godiva will make a delightful Valentine's Day gift for them. The sweetness of these treats will melt their heart and make them fall in love with you all over again. The image displayed is only indicative in nature. Although we make 100% efforts to match the image displayed, the actual product delivered may vary in shape or design as per the availability. A majority of our orders are delivered on time as per the time slot selected. This is not met in very rare cases where the situation is beyond our control viz., traffic congestion enroute, remote address for delivery, etc. Please consume the chocolates according to the best before date mentioned on the pack. Once the order is prepared for delivery, the delivery cannot be redirected to any other address. Although we try not to, occasionally substitution of handmade chocolates is done due to temporary and/or other unavailability issues. Please be noted that we may have to do this without informing you because we give utmost importance to delivery on time since most of our orders are gifts for a certain occasion. Store your chocolates in the refrigerator. If they are exposed to high temperatures, they may begin to soften, compromising the appearance and flavour. Please refer to the expiration date on the package and consume your chocolates before that.